One ought to recognize that the present political chaos is connected with the decay of language, and that one can probably bring about some improvement by starting at the verbal end. If you simplify your English, you are freed from the worst follies of orthodoxy. You cannot speak any of the necessary dialects, and when you make a stupid remark its stupidity will be obvious, even to yourself. One cannot change this all in a moment, but one can at least change ones own habits, and from time to time one can even, if one jeers loudly enough, send some worn-out and useless phrase — some jackboot, Achilles heel, hotbed, melting pot, acid test, veritable inferno, or other lump of verbal refuse — into the dustbin, where it belongs. via George Orwell, “Politics and the English Language,” 1946. An explanation problem exists when there is a mismatch between what is heard and what matters to the target audience. 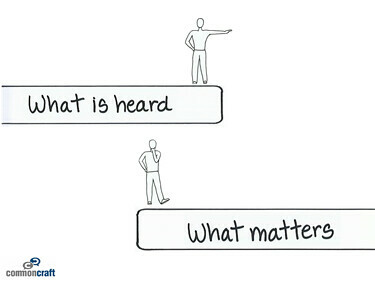 (…) Often, when someone asks “what is…”, they really mean “Why does it matter to me?” By considering what matters to someone, the answer becomes different and more likely to give them information they can act on. You achieve plain English when you use the simplest, most straightforward way of expressing an idea. You can still choose interesting words. But you’ll avoid fancy ones that have everyday replacements meaning precisely the same thing. And you will find several excellent tools at the plainlanguage.gov website.